If you search for cheesecake recipes on this blog you will find NONE. Yeah, I know. 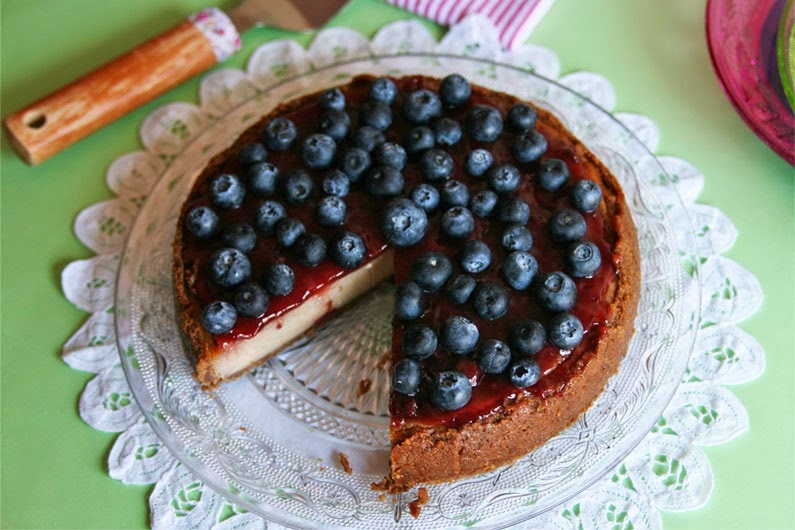 How come I've never published any cheesecake recipe before?! Ridiculous, shameful, weird...and if you wanna make me feel even more guilty feel free to add more negative adjectives, hehe. 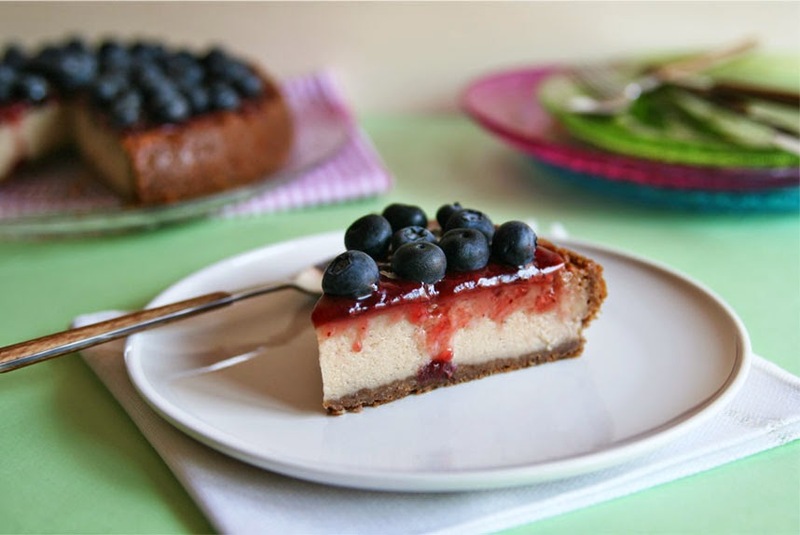 Now, seriously, since I started to develop this passion for baking I have baked several cheesecakes (and let me add, with great success) but for some strange reason I haven't shared any of my recipes with you, until now! 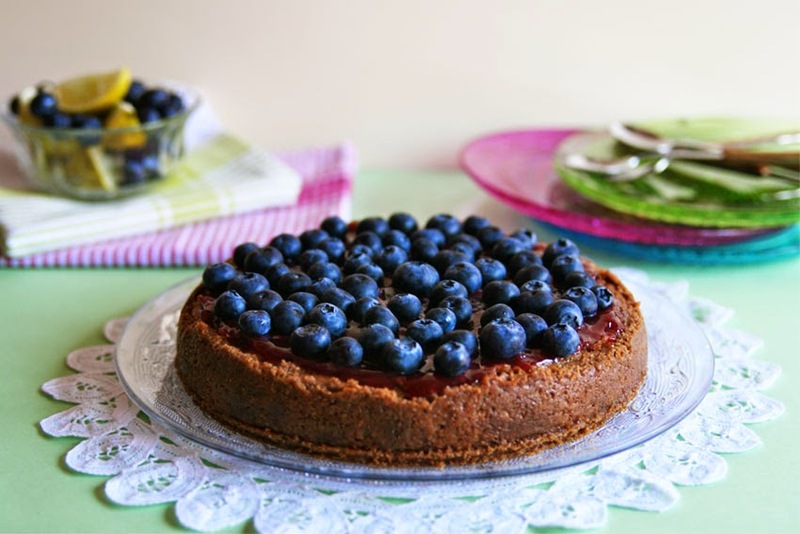 I guess the reason behind this cheesecake-less blog is that since I started to take care of my cholesterol levels some years ago I cut back on butter, full-fat cream cheese and dairy products in general (nowadays I removed butter and almost all dairy from my diet). 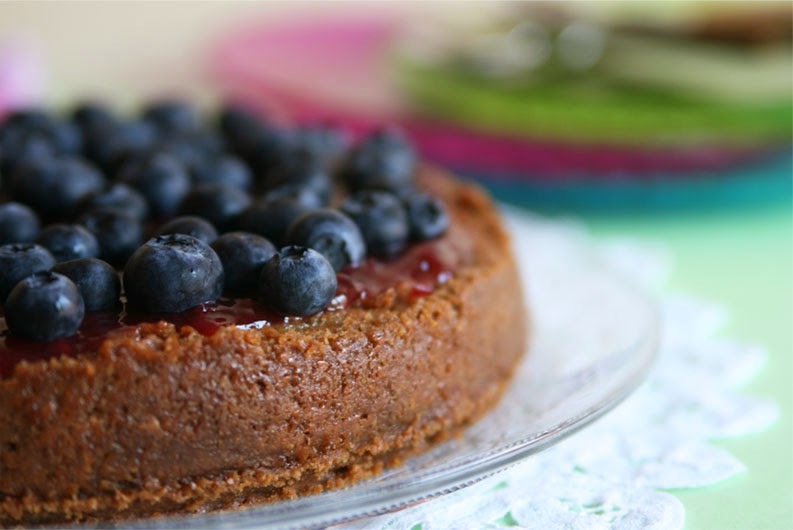 As you know traditional cheesecakes contain butter, cream cheese, heavy cream...etc. and I can't (well, I should not) eat them, that's why I stopped baking cheesecakes. I always try to make healthier food choices and use natural, organic, wholesome ingredients for each recipe I share with all my readers. I love to cook everything from scratch, give a healthier twist to my favorite classic bakery recipes and replace certain ingredients for others with more benefits for our bodies. I hope you forgive me for not posting a cheesecake recipe before, I'm sure you will after you see (and try!) 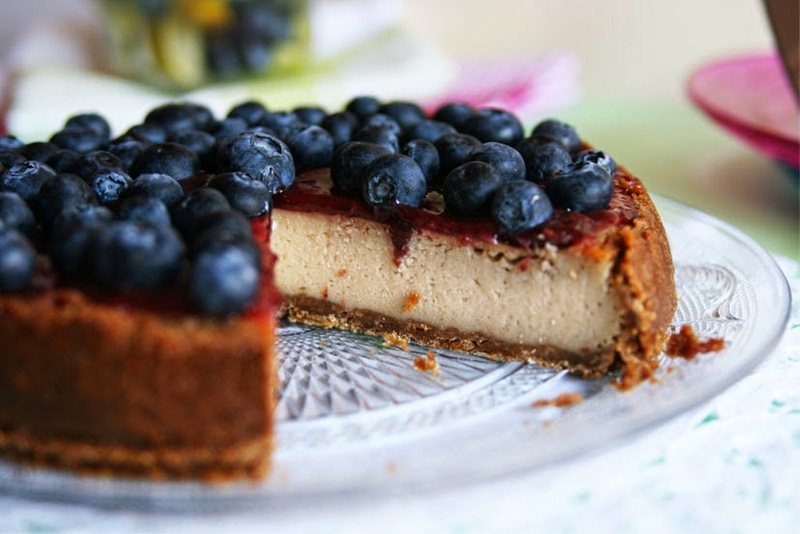 this Blueberry Lime Vegan Cheesecake. It's by far, and I kid you not, the best cheesecake I have ever tasted. 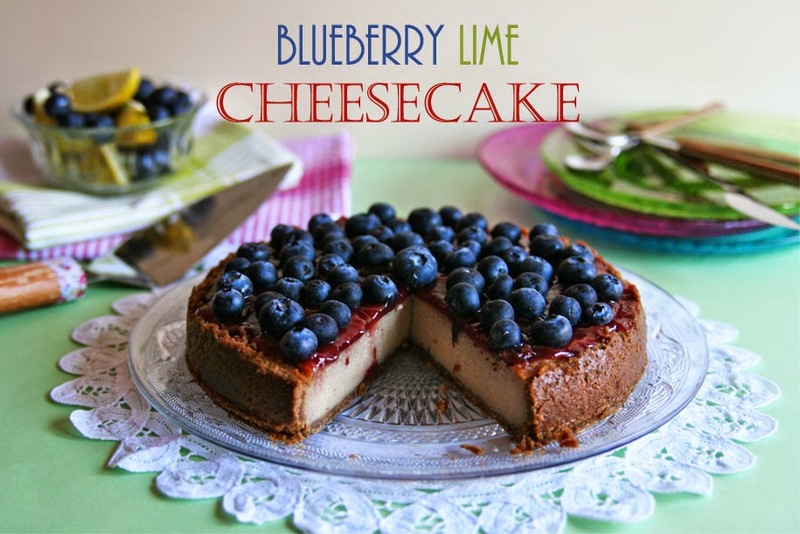 My mom is not a fan of cheesecakes (she's quite picky when it comes to cheese-based desserts) and she loved this one! The cake was gone in less than two days and not a single crumb was left! It's extremely creamy, not overwhelmingly sweet or tangy, with a nice stay-in-place crumb that will let you cut beautiful slices. It was so good I couldn't stop tasting the batter, it was like having a yummy and refreshing milkshake that you could drink with a straw. 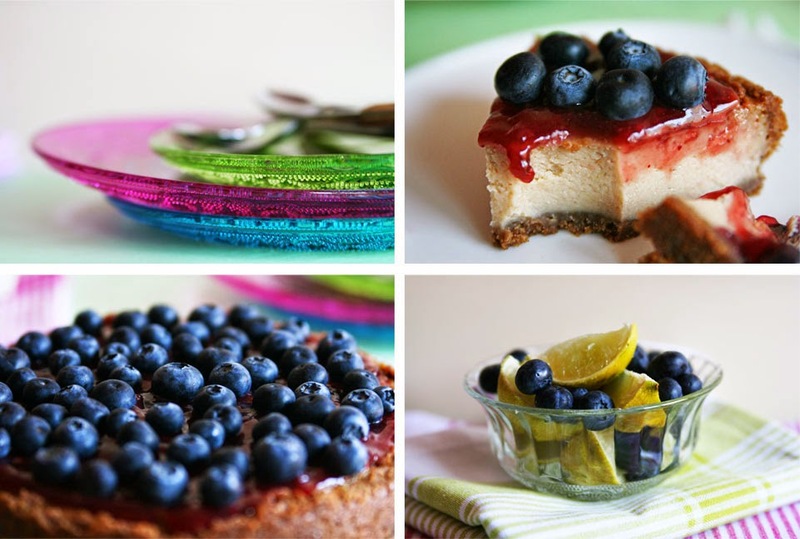 You can come up with as many variations as you wish and replace the blueberries for your favorite fruits, use a different jam, make a chocolatey crust and substitute the lime zest and juice for orange, lemon...try different versions and find your favorite one! 1/2 cup unroasted cashews, soaked in water overnight. 1/2 cup mashed ripe banana. 14 ounces (400g) silken tofu, drained. 2 tbsp coconut oil, at room temperature. Grated zest of 1 lime. 1 1/4 cups finely ground graham cracker or any vegan cookie crumbs. 3 tbsp melted coconut oil. Preheat oven to 350 ºF (180 ºC) and lightly spray a 8-inch (20 cm) springform pan with nonstick cooking spray. Place the cookies in your food processor and pulse until you get fine crumbs. In a medium mizing bowl, stir together the cookie crumbs and sugar. Drizzle in the melted coconut oil and mix well to ensure the crumbs are moist. Pour in the soy milk and stir again to combine all ingredients and form a crumbly dough. You might need to use your hands to blend the mixture and get a crumbly dough. Pour the crumbs into the springform pan and press them very firmly into the sides of the pan first and pat into the bottom. Bake for 10 minutes until firm. Remove from oven and place on a cooling rack. Let the crust cool before filling. Leave the oven on at the same temperature because you'll be baking the cheesecake just a few minutes after. Drain the soaked cashews and tofu. In a blender place the cashews, mashed banana, tofu, coconut oil, sugar, cornstarch, sea salt, lime juice and lime zest. Blend all ingredients together until completely smooth and you don't see any small bit of cashews. Pour the batter over the crust and tap it lightly on the counter to get rid of the large air bubbles. Bake the cheesecake for 50 minutes approximately, until the edges are golden and the top is lightly puffed and still looks a bit 'wet'. Let the cake cool before adding the topping. Scoop out the desired amount of jam and spread evenly on the top of the cake working from the center and spreading it to the edges. 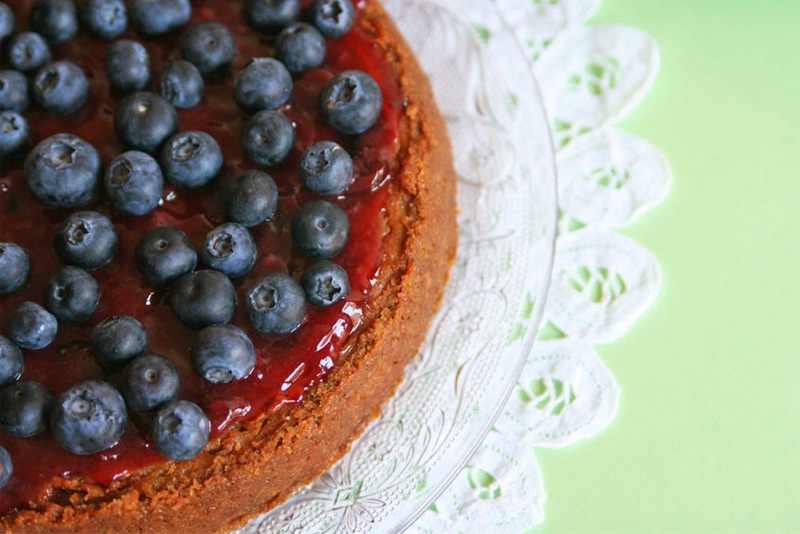 Sprinkle fresh blueberries over the cheesecake. Move the cake to the fridge and let it cool overnight for best results.